The most common plant allergy is due to poison ivy. Other offenders include poison oak, sumac, and the mango plant. All contain the same irritating chemicals, and all can produce itchy eruptions. Plant dermatitis follows exposure of a body part to the leaves of an offending plant or to materials that have been in close contact with the plant, such as animal fur, tools, or clothing. Between twenty-four hours and one week following exposure, an itchy rash appears at the site of contact. Tiny fluid-filled blisters arise in patches and streaks. 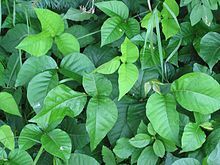 If the allergic material from the plant remains under the nails, poison ivy may be spread to unexposed areas by the fingers. Contact with the offending plant. The best way to prevent any allergic dermatitis is through avoidance. Persons susceptible to poison plant allergy (this includes about 60 percent of the population) should be familiar with these plants and remain vigilant when gardening, camping, etc. When walking in wooded areas, wear pants, long-sleeved shirts, and socks. Poison ivy plants may be physically removed (wear gloves!) or chemically destroyed. Exposed skin should be thoroughly washed within fifteen minutes to avoid penetration of the noxious plant chemical. Specific barrier creams (such as IvyBlock) may afford adequate protection when applied prior to exposure. Mild cases of allergic dermatitis may be treated with drying compounds such as calamine lotion and oatmeal baths. Severe cases of poison ivy, especially those affecting the eyelids, are best managed by a physician. Oral desensitization to prevent the allergic reaction of poison ivy is currently being tested but cannot be recommended at the present time. Wash all clothes, shoes and boots, including bedding, as well as tools and pets, that have come in contact with either the poison ivy plant or sores. It is the urushiol oil in the poison oak, sumac and ivy that causes the itching and blistering. If the itching is intolerable, run the hottest water you can stand over the rash. It will briefly get worse before fading for a couple of hours. After blisters form, cover them with sterile gauze to prevent infection. Acorns Native American Indians used the following: put two dozen or so cracked acorns into 1 1/2 gallons of hot water and boil down to half this amount, uncovered, for several hours. Then strain and cool the remainder and put on affected area. Another use of an oak is to boil a 2x4 inch section of sprig oak bark in a quart of water for 5 minutes; simmer for 1 hour; apply the liquid for relief of itching. Alcohol, rubbing Dermatologists at the University of California, San Francisco, recommend applying rubbing alcohol liberally to skin and clothing exposed to poison ivy, followed by a thorough washing with water. This can be done anytime within four hours of exposure. Alcohol is a solvent and draws the toxic oils out of the skin and clothing and prevents or reduces the rash and itching. Aloe Aloe vera juice can also be used to stop the itching and blistering, and it enhances the healing of rashes and sores. You may apply aloe as often as every two hours. Alum Apply a poultice of powdered alum in a petroleum jelly base. Apple cider vinegar To relieve itching, combine equal parts of water or alcohol and apple cider vinegar. Dab on affected areas, let dry, and repeat as often as needed. Baking soda (bicarbonate of soda) Baking soda to the rescue again! Put a tablespoon of soda in a cupful of water; more may be added if the water will dissolve it. Wash the affected area with the solution and/or make it into a poultice. Change often enough to keep the application cool. Cover open blisters with sterile gauze. Another remedy calls for making baking soda into a paste. Baking soda is a good drying agent. Bleach Household bleach can be used to remove the poison ivy resin and treat the itch. Dab the affected area with a cotton ball soaked in a mixture of half water/half bleach. If you put this solution on blisters, they should be gone the next day. Should the above remedy irritate your skin, try making a wet compress and add some table salt or Epsom salts to the mixture, and apply for 30 minutes. This will help dry out the area. Brewer's yeast Take large doses of brewer's yeast with warm water and honey four to seven times a day. This remedy has been suggested for poison oak, and results should be noticed by the end of the first day. Burrow's solution (aluminum acetate), available at drug stores, is a good drying agent. Buttermilk Keep affected areas wet with buttermilk. Calamine lotion Calamine lotion has been a standby for many years. Dab it on and let it dry. Catnip Get some fresh catnip leaves and squeeze it so there is some juice and apply to the rash. Catnip has anti-inflammatory properties and will help reduce the itching and heal the rash quickly. Cornstarch Dusting the affected area with cornstarch can also be used to relieve poison ivy itch. Another remedy calls for making cornstarch into a paste. Epsom salts Soak the affected area in a solution of Epsom salts and water for 30 minutes daily. Another remedy calls for making a paste with Epsom salts. Fels-Naptha Rub the body with Fels-Naptha soap both before possible exposure and afterward, leaving the residue to dry. One of the soap's ingredients, mineral spirits, may be responsible for the good results. After you have been exposed to poison ivy, wash off the resin as quickly as possible, even with plain water. Goldenseal Make a skin wash by combining 1 teaspoon of powdered goldenseal root with a pint of hot water. When cool, dab this solution on the affected areas. You can make a goldenseal tea by mixing a quarter teaspoon in a cup of hot water; take several times a day. This tea is bitter, so you may want to take capsules instead. Two to three capsules will expedite healing. Goldenseal comes in liquid form and may be rubbed on the skin. The herb's powerful anti-inflammatory and anti-infection properties will help the area dry up rapidly. You may also mix the goldenseal with water to dry up pustules. This remedy is also noted as beneficial for poison oak. Jewelweed Also known as impatiens and touch-me-nots, jewelweed can be used to stop the itch and dry the blisters. Rub the affected area with the leaves from this plant. Clinical studies have shown that this method works as well as cortisone creams. The juice from the stems can also be used; rub it on gently several times a day and let dry. Excessive rubbing, however, will irritate the area. A third variation is to boil the leaves, stems and flowers until the water turns a deep orange, and swab the affected area or apply as a compress. This method may be easier for large areas. Lobelia Add 2 teaspoons of lobelia to 1 cup of boiling water; let stand; apply mixture to the affected area. Mugwort Mugwort is used by Native Americans to treat poison ivy. Oatmeal Oatmeal is another useful remedy and can be used in several ways. One way is to make up some oatmeal, let it cool down to warm, and spread on the affected area. For cases where the whole body is affected, put three-quarters of a box in waist-high warm water in your bathtub and soak in it for awhile. Another bathtub method is to put the oatmeal in a sock and swirl it around in the bath water. Don't dry off when you get out, and the oatmeal will leave a powdery covering which will help stop the itch. Another remedy is to make a paste using oatmeal. Petroleum Apply crude petroleum every hour until inflammation is reduced, then wet affected areas with petroleum four times a day. Plantain The common weed plantain, found along roadsides, meadows and frequently in people's lawns, may be used to stop the itch and control the spread of the inflammation. Crush the leaf and rub it on the affected area. The skin may take on a green tinge temporarily, but plantain works quickly. This herb has broad leaves (4-10" in length) and long flowered spikes. Salt water Bathe the area with a warm solution of salt water. Soap Brown soap that is allowed to dry helps reduce the itching. Stinging nettles Apply juice from stinging nettles to the affected area. Sassafras Bathe the affected area in sassafras tea. Tea tree oil can be applied several times a day to reduce itching and promote healing of the blisters. Tofu If you have some tofu handy, cut it into pieces and attach to the affected areas. It should stop the itching. Vitamin C Taken in large doses, Vitamin C may also be helpful because of its antihistamine and detoxifying qualities. Dissolve a vitamin C tablet in water and wash the affected area. The juice of an orange or lemon is also very effective. Another way to use it is to take 1,000 mg of time-release vitamin C hourly. Take it as soon as you can after contact with the plant (poison oak), and be sure to take it at least three times during the night. This will help stop the spread and it should be cleared up in 3 to 4 days. Remedy compliments of Elizabeth Martz. Vitamin E rubbed on any raw areas will expedite healing. Watermelon Another remedy is to cut open a fresh watermelon and rub the area with the flesh and rind. Willard water Put this special water on full strength if your poison ivy is weeping, or follow the dilution directions for normal cases. The itching should stop immediately, healing will begin and you will notice improvement within a few hours. Willard water, a specially treated water, may be obtained at a health food store. Witch hazel Native Americans used witch hazel for inflammatory skin conditions. Dab some on the afflicted area several times daily with a cotton ball. Witch hazel, a good drying agent, will reduce the itch and promote healing. Zinc oxide is a good drying agent. Rhus tox 30c. Taken once a month will prevent problems from poison ivy. It should be taken sublingually (under the tongue). Rhus tox 6c will heal poison ivy in a few days.